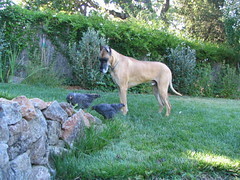 Urban Chickens Network blog: Chickens and dogs in the same yard? Got a shot of Argus (our 140 pound Great Dane) and the girls in close proximity this evening. Click on the picture at right to see the before and after of this shot. I'm surprised at how remarkably well our pets get along together. I guess Argus's early years tolerating three cats in the same house with him have made him a lot more tolerant of animals a fraction of his size. The girls themselves show no fear of Argus. In fact, if he wasn't so quick to move out of the way, I'm sure they'd do a lot more walking between his legs to get past him. While I haven't witnessed any boundary setting (via a peck on the nose) between them, I suspect one of those unsupervised visits in the backyard when I wasn't around involved a pecking order being set. And poor Argus, sans beak, wound up on the bottom rung. Now, if I could just get a picture of the girls perched on his back, that'd be a winner!